Each year, we comb through our internal data and share some of the insight we’ve seen throughout the calendar year. As a company that rents out tens of thousands of pieces of gear each year, we think we have a pretty good idea of market trends and the most popular products within the fields of photography and videography. And as often as we can, we try to share that insight with our readers. With 2018 being our biggest rental year ever, we wanted to share with you our most rented products for 2018. If this isn’t your first year seeing this annual list (you may want to peek at our list for 2017, and 2016), you’ve probably noticed some similarities from previous years. As per usual, the top of the list is handed off to Canon, with their practical Canon 24-70mm f/2.8L II, and the Canon 70-200mm f/2.8L IS II. In regards to #2 though, you may notice that it is the Mark II version, despite the Mark III coming out in August of this year. Perhaps because of the finding from Roger in his teardown of the Mark III sharing the same optics, the Canon 70-200mm f/2.8L IS II is still rented more than the Canon 70-200mm f/2.8L IS III on a scale of five to one. It’s not often to see Canon have a flop like this, but it seems people have far less interest in the new version over the tried and true old one. Canon hasn’t just been dominating the market with their 24-70mm and 70-200mm either. In regards to their mirrorless platform, the Canon EOS R is nearly twice as popular as the Nikon Z7 in our early numbers. While Sony still leads the charge in that market, certainly we expected more from the Nikon Z7 system. 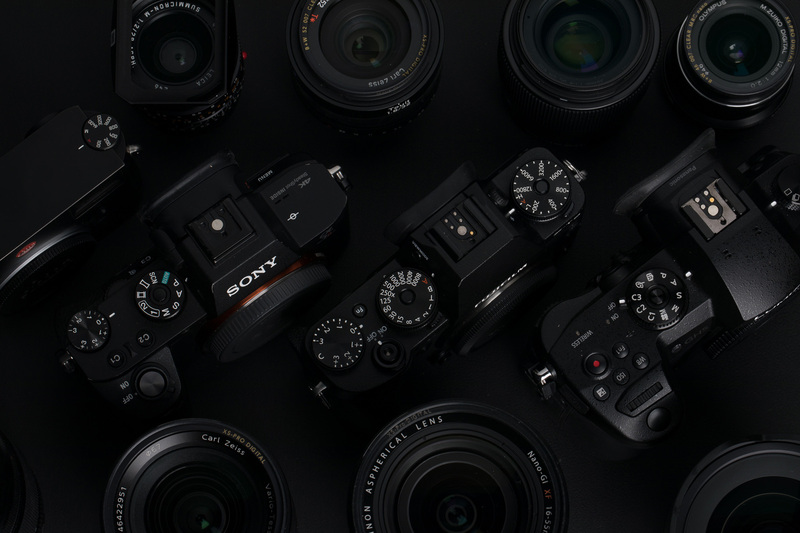 These are just early numbers, as both systems only came available on October, and will be dependent on how each brand pushes their mirrorless platforms over the next couple years. Keeping on the topic of camera brands and their performance, let’s take a quick look at market shares of each brand, based on our data for 2018. Panasonic and Sony showed marginal growths this year in rentals, whereas every other brand has shown marginal falls in their shares for this year. With Panasonic and Sony’s focus on affordable video cameras along with their pro-line of systems, this isn’t much of a surprise with more and more people transition into video work alongside their typical photography stuff. Despite these growths, Canon still has a clear lead in the industry, and it will take a while before we see Sony or anyone else catch up to them. Perhaps what is more interesting is looking at these numbers for lens brands. These numbers probably aren’t too surprising to those who have been following along over the last few years. Sigma has proven their place in the market, taking 3rd place in the market share, behind only Sony and Canon. Nikon has taken a small fall in lens rentals, whereas Fujifilm has stayed pretty consistent over the last year. Much of Sony’s grown comes from their new products released this year; particularly the Sony FE 24-105mm f/4 OSS, Sony FE 16-35mm f/2.8 GM, and Sony FE 100-400mm f/4.5-5.6 GM OSS. The same can be said with Panasonic, and their releases of the Panasonic 12-35mm f/2.8 X Power OIS II, Panasonic 35-100mm f/2.8 X Power OIS II, and Panasonic/Leica 8-18mm f/2.8-4 ASPH. However, we still like to use this data to get a good read on where the market is heading into the future, and one way to get that insight is by looking at the new products released this year. It shouldn’t come as too much of a surprise, but this year was fairly uninteresting – from a new product standpoint. Even still, the list does show what I’ve already addressed – more people treading into the waters of video as it becomes more viable and affordable. As a result, among our most popular new products, this year was the handheld gimbal platforms from Zhiyun-Tech and DJI. (Please also note – this data is taken from the calendar cycle ending in early November, hence the Sony Alpha a7RIII, Profoto A1, and other products technically released in 2017). For easy reference, here is the most popular products from last year – 2017. For a full breakdown of how everything performed in 2017, be sure to check out the end of the year post from last year. Does any of this information surprise you? Where do you see the industry growing for next year? Feel free to add your insight in the comments below, and stay tuned for next week, when some of the staff members at Lensrentals.com share their insight on their favorite new products of 2018. Exploring all around the world is an excellent and fascinating dream. We work 24 hours a day in our company to turn this dream into reality. Still how many really able to make money? We bring to you, this excellent on-line job opportunity created in a way that it can help you to obtain a nice income. Work on a daily basis and give your work few hrs and make money as much as $18000 every single week. It gives you chance to work from anywhere with flexible time and able to dedicate some quality time with your loved ones. It is time to convert your life and bring growth and happiness. Now go and have a look at, wonderful things waiting for you >>> SUPERB OPPORTUNITY!!! Taking a trip all around the globe is an excellent and intriguing dream. We work twenty four hours a day in our company to change this dream into reality. But how many truly able to make money? We bring to you, this excellent on line opportunity created in a way that it will help you to earn a nice income. Do the job on a daily basis and give your work handful of hours and make money upto $39000 each and every week. It provides you with opportunity to work from anywhere with very flexible time and able to devote some quality time with your family members. The time has come to transform your life and bring growth and joy and happiness. Right now go and take a look at, superb things waiting for you >>> SUPERB OPPORTUNITY!!! Taking a trip all around the world is a lovely and intriguing dream. We work 24 hours a day in our office to change this dream into reality. But how many truly able to make money? We bring to you, this excellent online opportunity created in a way that it can help you to make great money. Work daily and give your work handful of hrs and make approximately $35000 weekly. It offers you chance to work from anywhere with flexible time and spend some quality time with all your family members. The time has come to convert your life and bring growth and prosperity. Now go and take a look at, magnificent things waiting for you >>> SUPERB OPPORTUNITY!!! As a nightscape photographer, a lot of the Sigma glass is very tempting, but most of it is also way too heavy for me to be lugging it into the backcountry. I do wish they could make some more “modest” lenses that were still ultra-sharp and well-built. As a wedding photographer, unfortunately, I’ve lost count of how many utterly destroyed (or at least, definitely broken) Sigma Art lenses I’ve seen my co-workers using. Namely, all of the primes that you might think a wedding or portrait photographer would use, I’ve seen at least 1-3 copies of them be so messed up that the images look like tilt-shift images, or literally rattling apart at the mount or at other joints. The good news is, the lenses have a better serviceability than Roki-Yang lenses. I usualy opt for Rokinon though, still, because they’re just so dang cheap, plus they’re usually a bit lighter and yet still just as sharp (or sharper, depending on the criteria) than a Sigma. I had high hopes that Roki-Yang’s SP/XP line would solve all their QC (sample variation) woes, and that they’d generally be more “indestructible”, but I suspect the lenses are still no more indestructible than a Sigma Art lens, (which isn’t very indestructible, depending on what you shoot and how you shoot it) …and I’ve already heard reports of sample variation. Oh and their f/1.2 SP/XP lenses are ridiculously big and heavy, like, they’re skipping Art and going for Otus, lol. I’m not lugging that up a mountain. Those differences are very likely not statistically significant and certainly not practically significant. The differences are most likely due to sampling error or common cause variation. The only way to know is to run a 2-proportion test. Drew, this is a very nice analysis and does not come as a surprise to me. As a Six Sigma Black Belt and Design for Six Sigma Master Black Belt, where I used to teach stats to scientists and engineers, its good to see that you resisted the use of pie charts to display data. I’ve always found Pareto charts to be more informative. Just a question, does the category to Most Popular New Gear relate to products released in that calendar year (e.g. 2018?). Thanks, Stephen. No, I’m aware of the adapter, I just don’t think an adapter is a long term solution, but rather, a transition item until the lens lineup can be better developed. Those renting the EF 50mm f/1.2 L have shot enough to realize correcting field curvature in a lens to the point it kills others when shooting flat test charts is a sure way to also kill the smoothness of the bokeh rendered by such a lens. It’s not so much that the 50/1.2 L is “soft” on the edges. Rather, the lens is focused slightly in front of the edges of the chart when the center of a flat test chart is in sharpest focus. If you want to shoot the best photos ever taken of flat test charts, the 50/1.2 is certainly NOT your lens. If, on the other hand, you wish to shoot portraits with very smoothly rendered out of focus areas, then you realize that the best lens for that job will never demonstrate corner-to-corner sharpness shooting a flat test chart. You seem to forget the MC-11 adapter ? Generally speaking, our data is skewed greatly towards professional users as they rent more. Not a lot of consumer-level users are going to pay $50 to rent a kit lens. One thing we don’t have solid data on is what percentage of the rentals for each still camera / camera brand are being used for video production. Its quite possible Olympus is doing fantastic with photography consumers but that in our data Panasonic has a much greater representation because of all the pro video users who are using the GH5 series for video work. You mention twice that Nikon’s body share fell. But your chart shows 15.28% this year and 15.06% last year. That would be an increase, not a decrease. Am I missing something? For a little context, there is one other frequency set, Range B, but we carry almost no more copies of that product because the FCC is eliminating the frequency range it covers from the useable spectrum for consumer wireless devices. It’ll be reserved for cell service starting sometime in 2019. We’ve been swapping most of our copies over to frequency A for that reason. So, while they are still available for the time being, if you rent more than a few B-range frequency kits from us, it’s likely you’ll get a call recommending a switch to A frequency for stock reasons. That should explain the drastically different rental numbers between the two otherwise identical products. Yeah, but Sigma in the Sony ecosphere is still new…and I don’t think they’ve yet adapted much of their lenses to the Sony E mount. Certainly can’t talk for everyone, but I don’t actually own a 24-70mm…and quite a few friends of mine who are professional photographers don’t have one either. Nearly my entire kit is prime lenses, and would rather rent a 24-70mm the once or twice a year rather than throwing down $2,000 for the latest – especially if it’s just going to be sitting around gaining dust for the majority of the time. It’s really difficult to compile a list of who rents from Lensrentals.com, and delegate them into a marketshare – and certainly I wouldn’t be the person with that knowledge. But from what little I do know, I know it’s a pretty broad range of people. We get anything from dad renting a Sony RX100IV for the family vacation to Florida, and never renting again…to movie productions renting half a dozen RED Epic cameras for a month for a major movie production. While most of our rentals seem to be the semi-pro to pro shooters who need specific gear for a specific job, we have a pretty broad scope. As for if I had the position at Olympus, I’d focus on the same thing that other brands that are succeeding are doing – video/photo hybrid systems. Nikon saw the falls of their sales numbers when Canon jumped headfirst into DSLR video ten years ago, and Nikon only limped into it. They’re still facing the image of ‘not being video focused’ ten years later. Same could be said on the other side – Sony and Panasonic are both growing much faster than other brands, and they’re doing video better than the competition with the a7sII and GH5/GH5s. I think a lot of this will change with the new L mount system developed (https://www.cinema5d.com/l-mount-alliance-leica-panasonic-and-sigma-announce-cooperation/) by Panasonic, Leica, and Sigma. Ultimately, lens lineup is far more important to shooters than the camera body, and people should do what they can to align with Sigma; as they’re quickly taking over that industry. But all of this is a little bit of fodder. It wouldn’t be wise to use a single year performance to judge a specific brands place within the industry. For example, the 12-35mm is by far the most popular Panasonic lens ever rented, and the 35-100mm is the 2nd most popular Panasonic lens ever. Both of those lenses have a 2018 release date, and are a huge contributor to Panasonic’s growth in the market – based solely on our numbers. Olympus has been kind of quiet this year, which could account for their falling numbers. What puzzles me is why so many people (presumably demi-professionals) rent the 24-70/2.8. I’d think this would be like renting a toothbrush: you know you’re going to be using it all the time, so why not just buy the dratted thing? Or, looked at another way, I wonder what these people have on their cameras when they are NOT using a rented 24-70…? Out of curiosity, you have a good read on what it’s used for? Portraiture? Video? Adapted on Sony? Not sure really what this does say. People will rent something they don’t own to try it out. Would be best to know of what rented did people not return and actually bought. That would say what is really the strongest in the market. Owning a Nikon Z7, renting a Canon R, returning it and being more happy with you Z7 purchase, is a possibility. What your numbers do say though is Panasonic does not have a marginal growth. 6% upto 9% is quite asignificant increase. Maginal growth was observed for Nikon and Sony. Whereas Canon had marginal drop. Sennheiser G3 Wireless Mic Kit -Freq A ?—?I presume there are other “Freq” versions of this. I wonder: does it makes sense to separate them? Would counts change much if they are aggregated together? This is quite interesting and illuminating, thanks for sharing your valuable data with us. I’m a little surprised to see Sigma only in #3 (they have access to all three major players, after all, and so could eat rental share from all of them). Sony in the #2 spot is a foregone conclusion by now – they’re steamrolling this ‘hybrid camera’ thingy, and lots of people are eager to see for themselves what the fuss is all about. Nikon’s slow but steady bleeding is showing more and more, and it’ll take them massive strides in product development and QA to revert it. I’m happy for Panasonic’s big leap in rental share. They deserve it. Zach Sutton – thanks for the article. Knowing from the studies of statistics that small changes in small sample populations can cause overstated analysis, adding that photo equipment rentals places tend to be used more by semi and pro photogs than casual shooters: if you were a board member at Olympus, would you be suggesting some sort of significant change to their ops/strategy? 0.5% drop (1/3rd) from last year and lenses lumped under a sagging “Remainder of Brands” while your ex (Panasonic) not only has eloped with Leica but has both cameras and lenses up in YTY sales. They have no natural partner prospects among the big 3. Ceding the semi and pro market and trying to live on the fickle and volatile casual shooter market seems like Oly (and possibly m43) could be on outside looking in. First casualty in the new mirrorless world order?